Thousands of organizations trust CDT because of our experience and dedication to client partnerships in creating drug free environments. We have been helping organizations for over 30 years to enjoy higher productivity, improved morale, and lower stress levels through comprehensive drug and alcohol testing that results in fewer accidents, less days off and a safer more efficient workplace. Our nationwide team provides complete substance abuse testing solutions that meet federal and state guidelines, using the latest screening methods, available for our clients 24/7. CDT provides expert experience and drug testing services that help schools nationwide to enjoy safe, drug-free campuses and transportation. CDT has maintained the vast majority of our school clients for over 25 years, including the largest school district in California. We test student athletes, academics, teachers, maintenance staff and school bus drivers, keeping kids, teachers and campuses safe and fair. Between 16.4% and 18.9% of truck drivers are current drug users making the sheer magnitude of drug testing sometimes daunting. 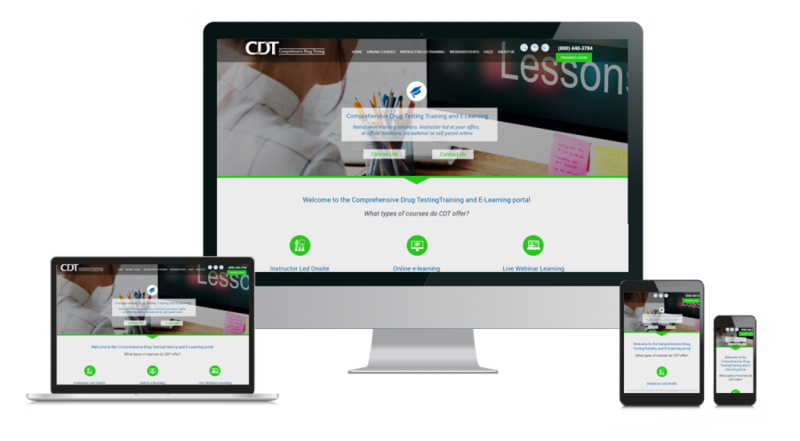 CDT’s total program management handles every facet of your substance abuse testing program. Our staff have the expertise and commitment to keep drivers and transportation fleets running smoothly and drug-free. We partner with you to ensure full program compliance for DOT and non-DOT drug testing programs including; policy development, scheduling, random pool management, expert consulting, pre-employment physicals, 24/7 post-accident collections and supervisor training. Surprisingly, 40% of construction fatalities involve substance abuse and 71% of union members are in favor of drug testing. CDT understands that each job site location, crew and situation is different. We work with construction and industrial companies to design programs tailored to the unique needs of each site. CDT manages one of the largest nationwide Construction Chapters in the U.S and partners with both large and small organizations. We are proud to be trusted by industrial and construction companies for drug testing that limits risks, lowers costs and maintains industrial and construction workplace safety. Whether an employee is gathering shopping carts from the parking lot or driving a forklift in a warehouse, safety and staff retention are concerns. It can cost $3,328 to find, hire and train a $10 an hour employee while 10.8% of retail employees report they have used illicit drugs in the past month or 22% in the past year. With fast, accurate, pre-employment and post-employment drug testing, CDT helps to identify drug abusers, reduce employee turnover and maintain safer work environments. CDT’s criminal justice and corrections testing offer an array of options for police, parole and drug courts. Options include rapid response testing, hair, urine, alcohol and oral fluid – all with the ability to be collected in clinics or on-site. 65% of all new inmates are drug users when they enter prisons, and CDT has the skill, expertise, and specialized knowledge needed to service the clientele of the legal system. CDT is proudly entrusted with the largest drug testing program in the state of California. Our security, integrity and confidential program methods provide the correctional and legal system the highest levels of service. CDT provides quality drug and alcohol testing program management services for local, state and federal government employees across the United States. With extensive experience working with government agencies, CDT understands the strict regulatory requirements. We ensure that programs cover every detail for the smooth, compliant management of your substance abuse testing programs. From the beginning of the bid process, to implementation of the contract and throughout the length of the contract term, the CDT team provide expert recommendations delivered with friendly professionalism. CDT partners with many local and nationwide hospitals, clinics, specialist and urgent care facilities. Healthcare organizations depend on CDT for expert advice on medical profession drug and alcohol testing. We have experience dealing with difficult circumstances including breath alcohol testing and specimen collection. With 24/7 responsiveness, we help medical facilities to ensure a safe, drug and alcohol-free workplace. First Responders are being tested for substance abuse more and more. CDT’s team works with First Responders to create comprehensive drug testing solutions for the public safety sector. We work side by side with many State Law Enforcement Officers. Being an Intoximeters trainer, we have built strong relationships with clients through industry support, drug and alcohol testing knowledge, and breath alcohol training. CDT understands the sensitive nature of testing First Responders and handles every situation with the highest regard of respect, integrity and confidentiality. CDT was founded on sports doping control expertise after our CEO Kim Jasper, Pharm.D. served as the Director of Doping and Gender Verification at the 1984 Los Angeles Olympic Games. For over 30 years, CDT has grown to become a leader in the sports doping control world. As qualified experts, we will manage your sports doping control program with precision, efficiency and the utmost confidentiality.